Homelessness in New York City has been steadily climbing for three decades as wages have stagnated and housing costs increase. Yesterday, the city’s mayor, Bill de Blasio, announced his plan to address the city’s 60,390 people without homes: NYC will open 90 new shelters in five years. The city will open 20 new shelters in 2017 and 20 in 2018. Existing buildings will be used to open shelters, and 30 current shelters will be renovated and expanded. The city would have access to $300 million in the capital budget and direct funds from the homeless services budget to accomplish their goals, which include decreasing the number of homeless people in the next five years by 2,500. 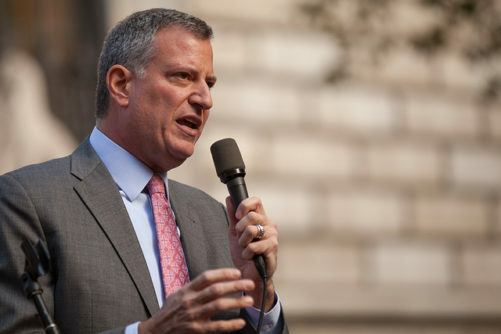 The mayor’s plan will replace the hotels and cluster sites (multiple apartments in low-income neighborhoods) currently in use, scattering shelters among the five boroughs. The goal is to stop using hotels to house the homeless by 2023 and stop using cluster sites by 2021. Cluster sites have drawn the focus of lawmakers, advocates for the homeless and the communities where they exist.